Posted on May 30, 2017 by Admin. Posted on May 14, 2017 by Admin. Posted on May 9, 2017 by Admin. The International Conference of Undergraduate Research (ICUR) is an annual event that is unique in concept and design. Using the latest in high-definition video conferencing technology, it connects students from universities across the world to a single 24-hour forum. It is a platform to showcase the work of some of the world’s best undergraduate researchers from any discipline or area. Undergraduates present their research in joint sessions alongside peers on the other side of the world, interacting with fellow presenters and audiences in real-time through video-links and social media. The International Conference of Undergraduate Research (ICUR) will be held at BaruchSeptember 26-27, 2017. Show off your work, gain valuable feedback, and have a real professional conference on your resume! Even if you are graduating this semester, you can come back and present the work you did as an undergraduate. You will give a 15-20 minute presentation on a panel and then discuss the papers with students in England, Australia, South Africa, and elsewhere linked via teleconferencing. This conference, organized by the University of Warwick in the United Kingdom and Monash University in Australia, links students on panels at 9 campuses on 5 continents via cutting-edge teleconferencing technology. This is a low-stakes, but professional academic conference, in which you can hone your oral skills, get feedback on your work, and hear what kind of research students are doing at international universities. This will be the fourth annual conference in which Baruch has participated, and students in the past three years have found the experience to be exciting and rewarding. Baruch is lucky to be the only U.S. college participating. Other global participants are Nanyang Technological University, Kyushu University in Japan, Singapore Management University, Monash University Malaysia, Leeds University in England, and Monash University South Africa. See www.icurportal.com<http://www.icurportal.com> for information. To participate: Students in all fields are eligible. Students must submit a 250-word abstract and title of their research. If you submitted an abstract to Creative Inquiry Day, you can use the same or similar abstract. If you have any questions, please don’t hesitate to contact me atKatherine.Pence@baruch.cuny.edu<mailto:Katherine.Pence@baruch.cuny.edu>. Posted on May 7, 2017 by Admin. 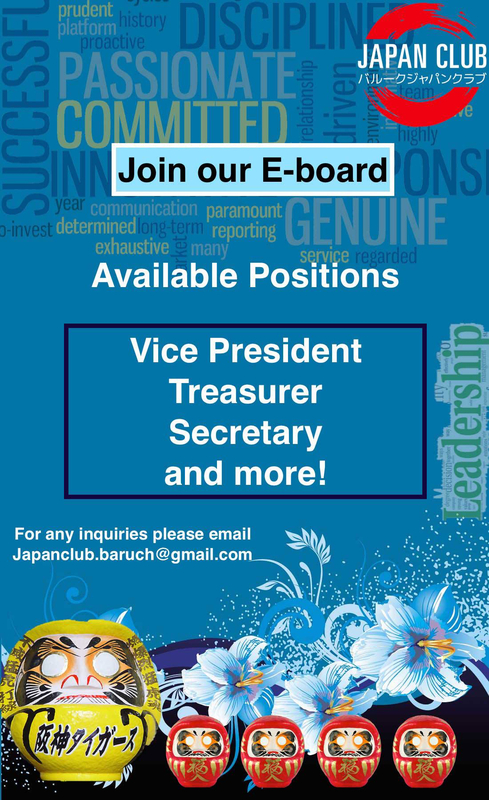 Baruch Japan Club is an organization dedicated to bringing together a Japan-loving community on the Baruch campus. We focus on assisting students in building relationships with Japanese organizations and business communities in and around NYC, as well as introducing Japanese culture to students and beyond. We are currently looking for self-driven individuals to join our 2017-2018 Executive Board! 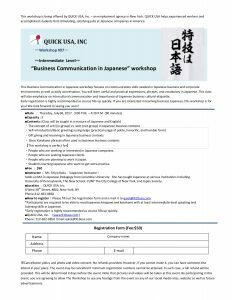 This is an opportunity to develop your leadership skills, build up your personal network, and delve into Japanese culture. If you are a passionate individual who would like to be part of the team for the 2017-2018 academic year, please fill out the short application below. Posted on May 2, 2017 by Admin. Join Japanese-language students and native Japanese speakers at this informal gathering to practice Japanese and English! 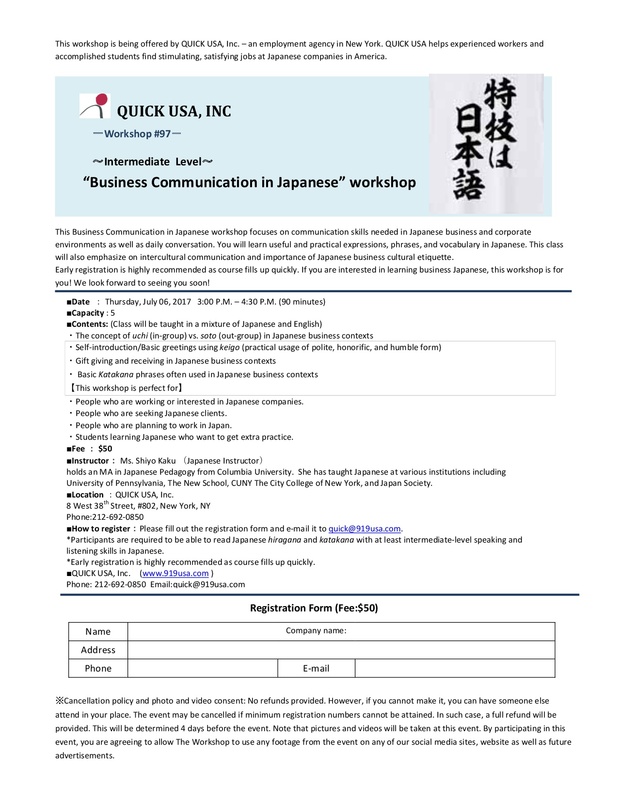 Anyone some Japanese language experience is welcome to attend. For 30 minutes during our May 8th meeting, special guest Souheki Mori will demonstrate how to properly wear a casual cotton kimono (Yukata). Yukatas are often worn in onsen towns and is the typical dress code for guests at a ryokan. Yukata has also become a way of dressing for summer festivals. After the demonstration, we will move back to the usual activity of practicing conversational skills. $5 (cash only), free for students with valid university I.D.